Dak Prescott and Ezekiel Elliott lauded one another after leading the Dallas Cowboys to a playoff win against the Seattle Seahawks. 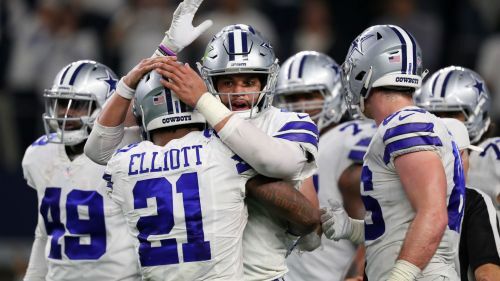 The Cowboys had not won a postseason game since Prescott and Elliott arrived in Dallas in the 2016 NFL Draft, but the team's star performers stepped up to the mark on Saturday in a 24-22 triumph. Quarterback Prescott threw one touchdown and decisively rushed for another in the fourth quarter, while running back Elliott had 26 carries for 137 yards as well as a touchdown. On the field in the moments after sealing victory, Elliott told FOX of Prescott's contribution: "He's a grown-a** man. That's what it is. That's how he played today." And Prescott's assessment of Elliott was similarly glowing, adding: "He's a hell of a player and he always wants the ball. "When you've got a player like this – the best guy in the NFL with the ball in his hands – we try to do as much as we can to give him the ball. I'm thankful to have him, my best friend." The love-in then continued as the pair analysed the game with reporters. "[Prescott was] legendary," Elliott said. "He came out there and made plays when we needed them, especially in his running game. "Whenever you see a quarterback who can run like that and break tackles – he's done it a couple of times this year – it's really tough on their defense. Dak came out there and he played his tail off." Prescott said of Elliott's use of the word "legendary": "I'm in a young career. I'm three years in. For him to say that, I may have to tell him to not say that again, or to wait until later. It's a hell of a compliment."